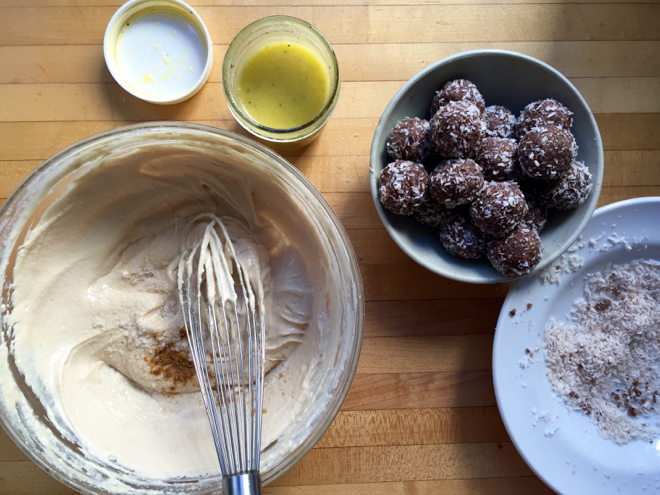 Tahini sauce with garlic, lemon and cumin; classic vinaigrette; ginger, date, nut, tahini balls. This does not look like my typical mid-summer blog post photo. It is not a typical mid-summer. I have just been diagnosed with breast cancer and have been learning about foods to nourish me during this journey–chemo therapy and eventually surgery. I am eating tons of fresh vegetables but I am also eating more plant based fats and no more sugar or much in the way of animal products. There is a lot of interesting research on diet vis a vis breast cancer, though I have to say my diet to-date has been pretty darn near ideal to have lowered my risk for this situation so the learning curve has luckily not been as steep as it might have been. I hope to share my culinary explorations throughout this caper here as I intend to make this as delicious and nourishing a time as possible. I’ve been making batches of the goodies above: a rich tahini sauce (the latter half of the linked recipe) inspired by the Zahav cookbook using the tahini they use which is better than any I’ve ever tasted. I top vegetables with this creamy sauce/spread, I thin it out to dress salads, I spread it on bread, and eat it by the spoonful, mix it with roasted eggplant for baba ganoush etc. Having a ready made vinaigrette on hand means that I can dress up any vegetable, cooked or raw, at a moments notice. It is the difference between wanting to eat veggies rather than moping that I’m not eating any cookies these days! And the Gingery Date & Nut Balls come in where the cookies used to be. I look forward to developing a local (Oregon) version of these with dried prunes and hazelnuts instead of the dates and pecans I’ve been using. 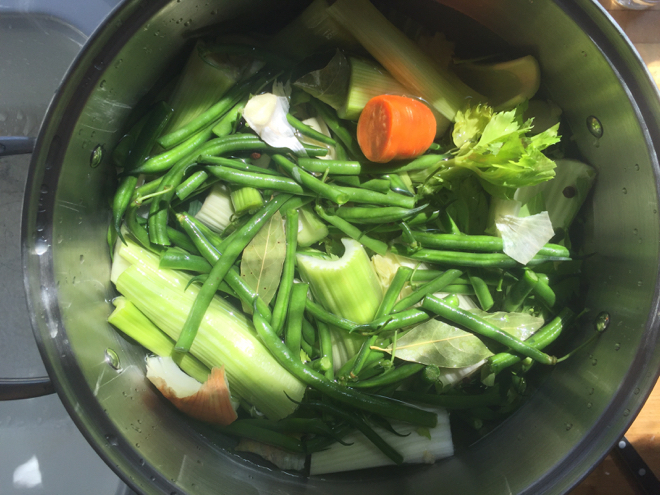 Finally, here’s a shot of the (beginning of the) vegetable broth that will be key to my therapeutic fasting before, during and after chemo each time. I’ll devote a whole post to this part of the regimen soon. These are fragrant thanks to the ginger, cardamom and cinnamon and rich from the nuts, fruit, tahini and cocoa. Process nuts in food processor until finely ground. Add dates, spices, tahini, salt and process again until it starts to form a ball. Roll the mixture into balls and then roll in shredded coconut. Refrigerate and enjoy! Happy Summer and Happy Cooking! So sorry to hear of your diagnosis. Thanks Marion! love to you! Thanks for your post. I am sorry for the diagnosis. I am on a similar food/healing journey, so I look forward to learning more as you have energy and ideas to share. A huge help for me has been juicing veggies and fruit, plant based proteins and fish. I’m sorry to learn of your diagnosis. Be strong and fight well. I’m also very sad to learn of your diagnosis and so glad you’re using food to heal! Stay strong and fight back with loads of antioxidants and vitamin C. Cancer cells hate both! Breathe in all the oxygen and life force you can, they also squelch cancer cells. Wishing you the best and support from a naturopathic oncologist. Thank you so much for the lovely message and support and yes to the above! Shari and I are sending you good energy. Let us know if you need something. This is lovely. Thanks for sharing Candace! I’m so glad you’re writing about this and sharing the wisdom. Much love. Surely, you know so well about nourishing your mind, body, and spirit. You will be in my thoughts as I cook and eat in the way that you have so inspired. Oh, Katherine, I am sorry to hear this news of your cancer diagnosis. It is in your typical fashion that you are writing of this with thought for food and how it will nourish you through this process of treatment. Your experience and guidance will help others too, many of whom have/or will deal with this disease. Wishing you the best on your journey. Thanks Marilyn. The food aspect of this journey is giving me so much to be excited about, learn about, explore and share. Katherine, You are a mighty woman, bringing your journey and gifts outward to your community. I send you light and love and would love to cook for YOU! oh, hell, I am so sorry to hear about your diagnosis. My sister is a survivor. Best to you and yours. I am currently underemployed: I would be delighted to help, if I can. We’re also saddened to hear that you have breast cancer. You got this! You are in my thoughts daily!!! My grandmother was diagnosed with cancer and treated it with food only? The tumor shrunk and all symptoms disappeared for 12 years? Food only! Macrobiotic. Love to you on this journey. Wow! Good for her. I’m getting the big “guns” I suppose and the food. . . love to you. my aunt had a double mastectomy and has been cancer free for over 15 years, but just caught pancreatic cancer at stage one.. so luckily they did kemo for a couple of months to shrink it and she will be going in to remove it…. she got a lot of great support from the Pink Phoenix rowing team.. not sure if you are interested but it is a great group of awesome people. If you need someone to talk to, my auntie Kay worked at Good Sam hospital for 30 years and has a good ear and has been through quite a bit. You are a beautiful soul Katherine. #@$%! cancer. When does the chemo start? You’ll need to buy a new fridge/freezer to hold all the food all your friends and loved ones will want to bring to you. Strength and courage to you dear friend. My dear Katherine, I am so sorry to hear of your diagnosis. I know you will come through with flying colors. As well as you eat I am a believer that environment and genetics play a much bigger role. My son, in spite of not being a cook, has come through two cancers and a liver transplant in his 40+ years which all started when he was 2 yrs old. OHSU remains his second home. A lifelong learning curve and the reason I am so food conscious. I am so sorry to hear about your diagnosis. This seems way to common of an occurrence. Meditation & Qi-gong can be amazing tools to add to your box o fighting tools. Thanks so much for your note and good wishes Stephanie! Katherine, I only belatedly read your diagnosis, and wish you stellar treatment and a full, speedy recovery!